To ensure a brighter future for every child. Brighter Futures MX is a volunteer effort in Mexico dedicated to improving the quality of life of vulnerable families and children in Mexico. What if every child reached their full potential? How amazing that would be! We strive to make sure every opportunity is available for kids to learn and reach their full potential. You can make a difference, get involved and help us create a better tomorrow. 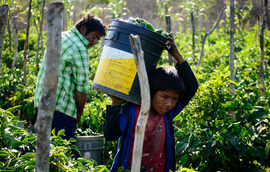 iNDIGENOUS FAMILY OUTREACH: An estimated 100,000 mexican children pick crops. ABOUT US: We are David & Stephy, together with our 3 boys we are full time volunteers in Mexico.